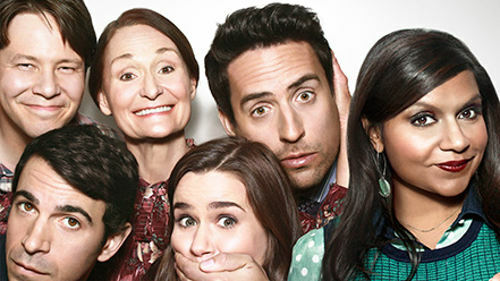 The Mindy Project, now in its second season on FOX, is one of my favorite comedies currently on TV. I think it’s a bit underappreciated (and maybe overshadowed by the very similar FOX show New Girl). It’s funny, relatable, and very fashionable. 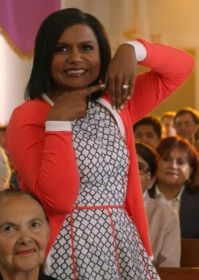 The Mindy Project stars the show’s creator, Mindy Kaling, as the young and successful doctor Mindy Lahiri. The show follows Mindy through her life in New York City as she tries to balance her busy job with friends, relationships, and everyday struggles. Her character is hilarious, and I find it easy to relate to her problems (and her many personality quirks). Mindy is clearly a fashionista. She loves shopping and clothes, and she always looks cute and stylish (even in her pajamas). She tends to lean towards bold colors and prints, often making adventurous fashion choices, but she also knows the power of a little black dress. She is adept at dressing for every environment, whether it’s the office, a date, a music festival, or just her couch. If you ever find yourself needing some bold style inspiration, Mindy is your girl. At the office, Mindy’s favorite combo is a button-down shirt, a skirt, and a cardigan. Though it’s definitely a casual office-appropriate look, she always adds some punch with contrasting colors or prints. To mimic her style, try pairing a navy polka dot shirt with a gray a-line skirt, then layer a red cardigan over top. Keep the rest simple with black tights, black ankle boots, and black bowler bag. Accessorize with a pair of conservative pearl earrings. Mindy loves dresses and skirts, and often pairs them with bold outerwear that’s ideal for the cold NYC weather. Try this blue collared dress with a plaid coat, and bundle up with a printed scarf and black gloves. Mindy loves her heels, so go for a cute cap toe pair. Add another pop of color with a yellow bag, and polish the look off with some pretty drop earrings. Though Mindy loves her sparkle and sequins, she often opts for a sleek black dress when she’s out on a date. Try one with some interesting detail (like this lace-covered dress), and pair it with sleek black pumps and a studded clutch. Keep your accessories streamlined with silver hoops and a silver cocktail ring. For a polished look, paint your nails a rich red and style your hair in bouncy, loose waves. Do you watch The Mindy Project? What do you think of Mindy’s style? Which look is your favorite? Let us know in the comments!